To ensure perfect reproduction of the determined tooth shade, accurate communication of the tooth shade determination to the laboratory is just as important as the tooth shade determination itself. Any misunderstanding leads to expensive and unnecessary extra work. The VITA shade communication diagram is helpful for the classic communication of the base shade. We have made this available to you here as download from the VITA Media Database. To analyze details or effects, a digital photo is necessary, in our opinion. The software of the VITA Assist and the communication app for smartphone and tablet VITA mobileAssist provide you with an option that makes it easy for you to reliably communicate all data – a laboratory shade formula. With this information, the dental technician can make a restoration quickly and reliably which will match the remaining teeth perfectly. Patients will be enthusiastic because there will be no reworking due to incorrectly communicated tooth shade information. 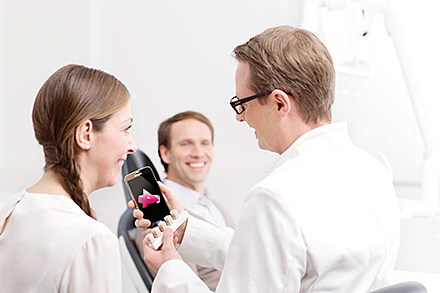 First, compare the results of the tooth shade determination with the patient's wishes. Take care to provide the laboratory with clear statements that cannot be misunderstood. A photo of the entire face of the patient can be a great help for the dental technician since he or she usually cannot see the patient. Document the specifications so that they can always be reproduced. Archive all cases.